Governor Chet Culver says he is “outraged” that “some” movie companies have taken advantage of a state program designed to lure the film industry to Iowa. On Friday Culver suspended the state tax credit program for movie productions and on Monday Culver fired the Film Office manager. 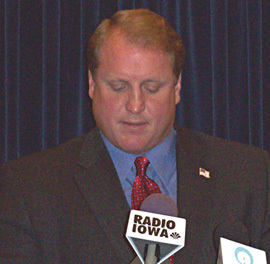 During a news conference this morning in Cedar Rapids, Culver read a written statement to reporters. Culver went on to chide film makers who blame the governor’s freeze on the state tax credit program for payroll problems. According to Culver, his staff has “reached out” to a number of film makers who have productions in Iowa right now and will — “on a case-by-case basis” — review the problems those film makers cite, but Culver is far from ready to restart the film tax credits. A reporter asked Culver why that “oversight” hadn’t been in place before. “That is a very fair question which had led to three people being removed from the Department of Economic Development and we’re going to get to the bottom of precisely why those steps weren’t taken to protect the taxpayers which is why I’m so outraged and upset that we have uncovered this,” Culver said. Last week, the head of the department sent Culver’s top aides a memo outlining “irregularities” in the film office. On Friday, Culver asked for and received the resignation of D.E.D. director Mike Tramontina and on Monday Culver asked for and received the resignation of Tramontina’s deputy. “For whatever reason these questions or concerns were not dealt with in terms of the mismanagement and we’re going to have a complete and accurate review of how it got to that point and why it got to that point,” Culver told reporters. Culver refused to say more about the exit of Tramontina and promised “no delay” in other activities in the Department of Economic Development, such as federal block grant money destined for flood recovery projects in Cedar Rapids. This afternoon Culver’s staff announced Fred Hubbell, a retired Des Moines insurance executive, is the interim director of the Department of Economic Development. Joe O’Hern, a long-time parliamentary officer in the Iowa House of Representatives who went on to work in the federal government, is the new deputy director of the agency. Culver met with a top FEMA administrator this morning and toured areas of Cedar Rapids that were hit by flooding last summer.